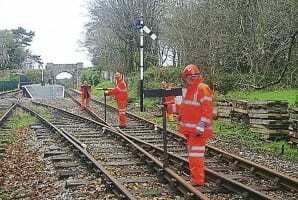 DESPITE being twice refused planning permission, the Helston Railway has now been given the green light to build a new station at Prospidnick Halt. A government planning inspector has granted the Helston Railway Preservation Society’s appeal against Cornwall Council’s refusal of consent for a platform, siding, access and facilities at Trevarno Farm, Prospidnick following objections from local residents. The railway may now construct a toilet block, keep using farm buildings for storage and land for a 60-space car park, as well as building a new access road. Previous Post:£1m government grant aid bonus for heritage lines!